The Emotionally Healthy Leader – A Book Review | Confessions of a Recovering P.K. Peter Scazzero and his church, New Life Fellowship, have emerged in the past decade as models of how to navigate through the world of church, leadership, and spirituality in an emotionally healthy manner. Scazzero started with “The Emotionally Healthy Church” back in 2003 and followed up with “Emotionally Healthy Spirituality” in 2006. In the midst of his sharing about his own experience, in 2010, his wife wrote “I Quit,” the story of how she had drawn the line when she could no longer put up with the emotional unhealthy ways of her husband’s approach to life and ministry. Now Scazzero has written “The Emotionally Healthy Leader.” In this book, Scazzero shares his experience of understanding and embracing limitations (your shadow), of finding ways to lessen stress and tension, and of moving towards allowing yourself to experience better emotional health. Early on in “The Emotionally Healthy Leader, “ Peter Scazzero writes about a time in his life where he, “always seemed to have too much to do and too little time to do it,” a place that many of us have probably come to in our own lives. Scazzero shares not only out of his successes but, more importantly, out of his failures. Scazzero shares examples of emotionally healthy and unhealthy leaders both through biblical examples as well as examples that he has encountered along the way. According to Scazzero, unhealthy leaders are those who have low self-awareness, who prioritize ministry over marriage/singleness, who do more activity for God than their relationship with God can sustain, and who lack a work/Sabbath rhythm. These four characteristics frame the rest of the book as Scazzero asks the reader to answer questions about facing their shadow, leading out of their marriage/singleness, slowing down for loving union with God, and practicing Sabbath delight. It’s important and essential for leaders to practice emotionally healthy leadership by allowing themselves to be transformed in order that they can help in the spiritual transformation of those whom they lead. Scazzero emphasizes the need for analyzing success properly, not embracing a “bigger is better” model but pushing for deeper and more significant success. He writes, “When it comes to the church and numbers, the problem isn’t that we count, it’s that we have so fully embraced the world’s dictum that bigger is better that numbers have become the only thing we count.” Scazzero stresses the importance of who you are rather than what you do and how being with God improves your emotional health more than doing for God does. A key point that Scazzero highlights is the need to address and face conflict rather than sweeping it under the rug. Too often, leaders (especially spiritual leaders) will adopt a “don’t rock the boat” approach as long as things are moving along. Scazzero points out the need to ask painful and difficult questions for the sake of everyone involved. If the “elephants in the room” are not addressed, the church and its leaders will need to pay a significantly higher price later on. Throughout the book are various exercises designed to help the leaders move through these various areas towards emotional health. He talks about the importance of establishing a rule of life, a means by which one can stay consistent and maintain a healthy balance between life and work. One of those things that he sees as essential is the establishment of a weekly Sabbath to incorporate necessary rest into one’s schedule. The surveys and assessments include questions that can help the reader move towards healthiness in the areas of facing and addressing their shadow, leading out of their singleness/marriage, growing in their oneness with God, and practicing Sabbath rest. The book is divided into two halves: the inner life and the outer life. After walking through the four essential questions that Scazzero lays out regarding your shadow, your singleness/marriage, your loving union with God, and your Sabbath, Scazzero moves on to how these things play out in ministry. He discusses the importance of planning and decision making, of culture and team building, of power and wise boundaries, and of endings and beginnings. 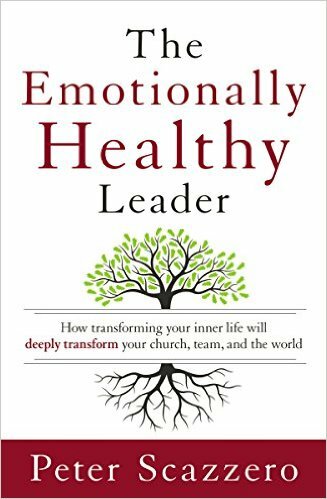 2/3 of the way through The Emotionally Healthy Leader, Scazzero writes, “We share openly about what God is teaching us – in sermons, staff meetings, private conversations, and with members of our small group.” I would say that may very well be the secret of his success: his humility. Scazzero leads from his strengths but is not afraid to confront, identify, and share his weaknesses and limitations. His humility is evident and he never comes across as a “know-it-all” but rather as one who wants to share his own struggles in order that others can avoid the same ones. He shares from his heart out of a desire to see others avoid some of the same mistakes that he has made in his life. Since Scazzero has been writing books for the last decade, the honest and reflective insights that he shares have been incredibly helpful to me. Having grown up in the home of a pastor and now being a pastor myself, what Scazzero shares is not something you can get in a basic seminary course, although it should be. Learning and embracing what Scazzero shares is essential and life-giving for those who are willing to take the time. I think that “The Emotionally Healthy Leader” is not just a good resource, but an essential resource for any pastor or ministry leader who wants to really see the kind of transformative growth to which God calls us in both ourselves and the people we lead. If you are serious about seeking out emotional health and aren’t afraid of embarking on a journey of renewal and restoration, then you need to get a copy of this book.